Forgive me if this goes astray. I started the blog, sitting in front of a roaring fire with a glass of Vouvray, a chunk of double cream brie and a baguette of bread, and ended it with 2 packs of frozen veggies strapped to my bruised ribs, thanks to a soccer game. After the move of the Royal Court, the Loire Valley lost it’s clout and it’s only been in the past 50 (and even more recently say 20 years here in USA) that the Loire Valley has re emerged from it’s local shell. Farming has been a huge part of the Loire Valley for a long long time. Grapes in the area date back to the time of the first buildings of Chateaux dotting the hillsides. As time evolved the Loire Valley wines became the highest regarded and thanks in part to the longest river in France which shares the same name, getting the wine of the Loire Valley to everywhere else proved to be pretty easy. However, because of those trendy royals being what everyone wanted to be like, when they moved to Paris and gained access to other things and their focus shifted - so did the following publics. Whine Wisdom: For as large as the Loire Valley is, only 1/3 of the area is AOC approved. The entire Loire Valley is so big, you can split it up into 4 regions - to make disecting it a little easier. First you got the Upper, that has a very continental climate and Sauvignon Blanc does really well there, also you will see Pinot Noir from this region - the Appellation names are the names of the small communities from which it comes. Pouilly - Fume Whine Wisdoms: AOC status began in 1937, mostly Sauvignon Blanc, and the soil is a Clay-limestone mix. Fume (smoky) not because there is necessarily a smoky taste to the wine, but named for the smoke like appearance of fog that fingers its way across the vineyards. <- great party trivia! Sancerre Whine Wisdoms: - Whites got AOC status in 1936, but reds took til 1959. Soil is mostly limestone with some clay and sloping. Menetou - Salon Whine Wisdoms: AOC in 1959, wines and soil are a lot like Sancerre, but thought to be more focused and elegant. Quincy Whine Wisdoms: AOC in 1936 - 2nd Appellation in France to be granted status. Soil is more Calcareous temps are a little cooler here too. Reuilly Whine Wisdoms: Tiny tiny little area right outside of Quincy. Touraine makes a variety of wines. 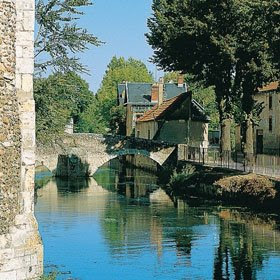 Sometimes in this area you will find wines blended from commune appellations and the wines are then given the appellation name of Touraine. Reds and whites are produced almost equally here. Whine Wisdoms: When you see a Touraine label, you will also tend to see varietal. Looking at a label and it says Touraine Mousseaux? well, it’s made mostly of Chenin Blanc incase you were wondering and has bubbles! Vouvray - Chenin Blanc is king here. The grape is made into several styles in this area. Bourgueil - Much like Chinon, but the soils are more clay, which tends to make the wines a bit fuller in body. Same grapes grown as Chinon. Method Champenoise sparklers from this area can be fund under the names Saumur Mousseux, Saumur d’Origine and Anjou Mousseux. - Lots of grapes varieties are allowed into this arena, which is kinda shocking given some of the rules. Savennieres - a Chenin Blanc (primary) white wine that is made to age. Possibly not something most of us think about when we are looking in the market for white wines, but Savennieres, will evolve over time in the bottle. Coteaux de Layon - This area is restricted to sweet and semisweet wines from Botrytized Chenin Blanc grapes (another strict wine law hard at work!) Considered some of the best of the dessert wines of Europe. Whine Wisdom: Depending on how deep your pockets are… don’t be snob and turn down the Coteaux de Layon - it could have been made with grapes from across the street of Quarts de Chaume! Whine Wisdom Nates: Most of the soil has clay mixed in with sand and gravel. and with that, I'm going to go find my half drunk bottle of Vouvray, and enjoy it with another wedge of brie!